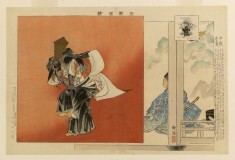 Description Okina is not a play, but a collective title for a performance of three dances that came to be incorporated into the repertory of the No theater. Individually the three dances are known by the names of the characters who dance them, Okina, Senzai, and Sambaso. Originating in ancient folk beliefs and prayers for a bountiful harvest, the dances came to be performed at special No programs, especially celebrating the New Year, the opening of a new theater, or the birthday of a revered actor. Okina wears the bearded white mask of a venerable old man. 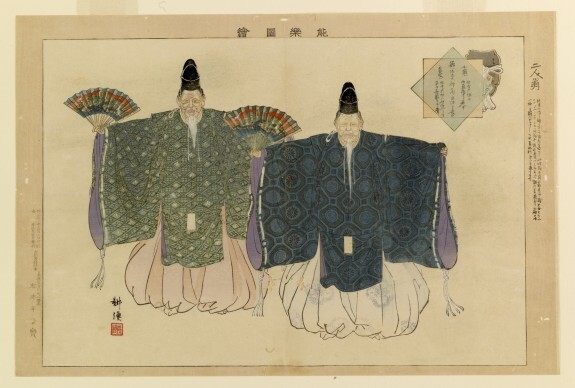 His dance is measured and stately with symbolic movements, including the slow folding and unfolding of his fan and furling and unfurling of his kimono sleeves. Provenance Mr. and Mrs. C. R. Snell, Jr., Maryland Line [date and mode of acquisition unknown]; Walters Art Museum, 1989, by gift.